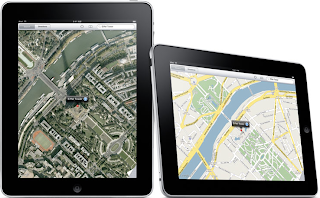 Robert Wray's Personal Blog: The iPad's role in your car? A GPS: (Assisted GPS) From the specs, the GPS looks great on the GSM models but it is hard to know until we test it. If it is as good as the iphone we have a winner. AGPS should be an improvement over the location technology in the majority of navigation devices. GPS accuracy and speed to a location fix is dramatically improved by quickly sensing the wifi and cellular towers nearby. This gives the user an approximate location until the GPS can lock you down to within a few feet. Connected features built in: Traffic, weather, gas prices, streaming entertainment, others. Enhanced voice recognition: I have been amazed at the accuracy of voice recognition on the iphone, specifically using built in voice recognition as well as third party applications like Dragon. A great microphone and a decent CPU are two critical elements to good voice recognition. The Ipad has about twice the CPU power of the iphone and most likely one of Apple's high quality microphones. Most nav devices use cheap resistive touch screens. Those that use capacitive screens use low quality versions or don't have the software to match the screen type. For after market devices, there is tremendous pressure to keep the total product cost low due to profit margins in the distribution chain. For factory navigation, auto manufacturers are forced to start planning their products years in advance before newer technology is released. Designers are also heavily limited in their materials and technology selection due to the consumer expectation that your in car nav device work for a decade or more in extreme environments with a very low failure rate. Touch screen for car computers are also slightly behind the times due to the lack of market demand. The bottom line is that new cars rolling off the lot have yesterday's technology. Larger screen: Since I am hitting the ripe old age of 30, my eyes aren't what they used to be. Even for you young wiper snappers, you should be able to read your device out of peripheral vision. A larger screen will help us stay focused on the road by limiting squinting to get us the data we need. Sunlight readability: There is a good chance the iPad will be sunlight readable, and we will find out on April 3rd. In Car mounting & Docking: The cables to make an ipad connect to your car radio are readily available. The key to making this feasible is a proper universal docking solution that is driver friendly. I have an e-mail into some docking station vendors to see if anything is on the horizon.